You know the drill: Drink more water. Eat less salt. Wear sunscreen. Get more sleep. Yet you still wake up in the morning with puffy eyes and black circles. It hardly seems fair, but it doesn’t take much for the dreaded under-eye pool to pervade. Genetics, seasonal allergies, stress, a glass of wine, and even sleeping on your stomach—they’re all common culprits for mild swelling (edema) in the upper or lower lids. While there are plenty of fancy eye creams out there, chances are good that they’ll only deflate your bank account. Here are five all-natural eye depuffers that are much easier on your budget and have some science to back them up. Of course, there’s no evidence to suggest these are permanent solutions to the morning sag, but they work quick to help you out in a pinch. Okay, it’s the oldest trick in the book, but this traditional spa ritual is legit. 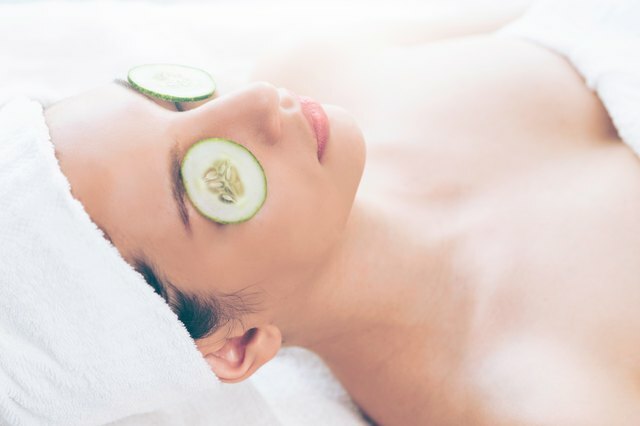 One of the most beneficial compounds in cucumbers is caffeic acid, which works to constrict blood vessels and temporarily reduce under-eye bulge. The cold temperature of the cukes helps a lot too. (That’s why people swear by other cold-comfort measures like chilled spoons.) 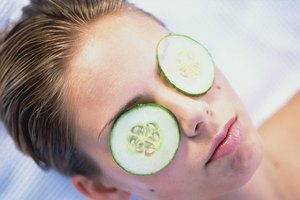 When needed, slice two half-inch pieces of chilled cucumber, apply to your eyes, and take a five-minute breather. Fair warning: Starchy potato juice isn’t as fresh and invigorating as cucumber. 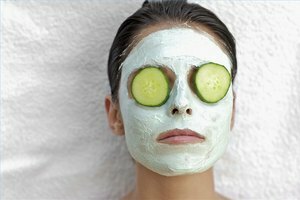 When finished, Canyon Ranch recommends you wash the area around the eyes and apply coconut oil to take away any dryness. Still shopping in the grocery aisles, egg whites are another natural helper for baggy eyes, but they work a little differently. Loaded with proteins, egg whites provide a powerful astringent effect to tighten, lift, and smooth the skin. According to integrative medicine practitioner Dr. Taz Bhatia, it’s “time to seriously stock up on organic eggs” because they also have the ability to minimize the appearance of pores. Egg white eye mask for breakfast? Simply whisk up two egg whites with a fork and gently dab under the eye with your index or middle finger. Leave it on for 10 minutes (you’ll feel the telltale tightening) and rinse with cold water. Then, continue with your morning makeup routine with fresher, brighter eyes. Renowned skincare specialist Dr. Adrienne Denese says that tea bags are an easy fix for a common problem. While you can use any kind of tea, green and black are the most effective because they have the highest concentration of caffeine and tannins. “The sudden jolt of topical caffeine tightens blood vessels which helps eliminate puffiness, swelling, and dark circles,” says Dr. Denese. Caffeine has also been shown to help improve the elasticity of skin. To help perk up tired, puffy eyes, simply steep two tea bags in hot water and allow them to cool to room temperature. 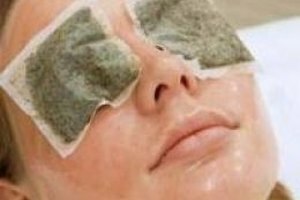 (The warmth of the tea bags is part of the treatment, but you don’t want them steaming hot for obvious reasons.) Apply them to your eyes and zen out for five to 10 minutes. Not a tea gal? 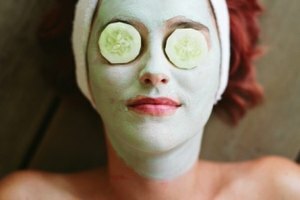 Kristin Collins Jackson over at Bustle likes a topical eye treatment of coffee grinds and coconut oil to take on last night’s happy hour. The area around our eyes has the thinnest skin, which makes it an easy place for lymphatic fluid to build up over the course of a day or night. While some experts suggest sleeping on your back and keeping your head elevated with two pillows (help us out, gravity), regular exercise and massage can promote lymphatic drainage and overall glow too. According to Dr. Axe, “The inverted poses [of yoga], such as shoulder stands and back bends, can help increase circulation to the face, which carries away excess fluid and helps relieve swelling.” He also says the area around your eyes will particularly benefit from special facial exercises. It turns out there is such a thing as yoga for your face. In The Yoga Facelift, licensed esthetician Marie-Veronique Nadeau explains how to de-puff and tone the orbicularis oculi muscle using light pressure and resistance from your fingertips. There may be no easier (or cost-effective) way to tell those unpleasant eye bags to namaste away.